Gethsemane's Prayer is the first in a series of Biblical historical prints in the Life of Christ series by artist Brian Jekel. "Then saith he unto them, 'My soul is exceeding sorrowful, even unto death: tarry ye here, and watch with me. And he went a little farther, and fell on his face, and prayed, saying, 'O my Father, if it be possible, let this cup pass from me: nevertheless not as I will, but as thou wilt'." Image Size: 19" x 17 1/2"
This canvas comes in a traditional style mahogany frame. Add $25 for shipping & handling. Framed Size: 30.5" x 30.5"
This canvas comes in a bronze-brushed mahogany frame. This website was designed & programmed by David's Web Creations. 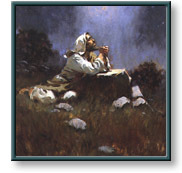 Gethsemane's Prayer copyright© 2002 by Brian Jekel is prohibited from being copied. All applicable copyright© laws apply and are reserved by artist Brian Jekel.